Little Felix started vuggestue, or nursery, about six weeks ago. Nursery is a very popular childcare option in Denmark. After maternity leave ends at 8-10 months, most women return to work and their children go to vuggestue. The wait list for particular nurseries can be up to a year, but we were fortunate to get a spot in a great daycare thanks to the fact that we are both foreigners (yay, a rare advantage!). The Danish government reserves spots for the children of two non-Danish speaking parents in order to help children "integrate" into society early. Our wait was only two months, but the wait list for Danes is 115 children deep! The Danish government subsidizes vuggestue, which means we pay roughly $550 per month for full time daycare. Felix only goes 3-4 days per week for 5 hours a day. The kitchen across from his room bakes fresh bread and organic meals twice a day, plus snacks. My most favorite part of his vuggestue is that the kids all sit around a table, family style, to eat meals. They learn to pour their own water, pass plates of food, eat with forks and spoons, ladle soup into bowls, and clean up their spot when they are done. The teachers eat with them so that the children see that food is for everyone--there is no such thing as "kid food" here. In the early days while Felix was settling in and I hung out, I watched kids gobble up bowls of broccoli soup, rye bread, and liver pate. The food is varied and healthy and I love that he is exposed to foods that I might not prepare (no liver pate in our house!). The start was a bit rocky for Felix since he previously had never been away from us while he was awake. We can count on two fingers (one, two) how many times we've gone out without him in the past 15 months. But the wonderful caretakers at vuggestue helped to soothe him and make him feel comfortable. The teachers (or pedagogues as they are called in Danish) all hold university degrees in early childhood education. They also receive in-house continuing education on various topics from cultural sensitivity to child development. Each pedagogue is responsible for 3-4 children, none of which are younger than Felix. Now that he is settled in, Felix loves going to vuggestue. He loves being around the other kids and having access to different toys and activities. The predictable and active routine has also helped him become a better sleeper at night. We went through a period of about two weeks where we dealt with "vuggestue syndrome," as my doctor called it, where he had everything from fever, ear infections and even Hand, Foot, & Mouth disease, but it seems to have strengthened his immune system now and he is thriving. I often wonder how confused he was by the initial language change. He seems to respond appropriately to the pedagogues now, showing that he is beginning to understand some Danish. When he is grumpy and doesn't want to do something he screams, "nej! nej! nej!" which could either be his first Danish word (no) or just Woody gibberish. We aren't sure. He especially loves the playgrounds at his school. Sandboxes! Water tables! Push toys! Brooms! Man, oh man, he loves those brooms. Mama is chopped liver (no pun intended) compared to the joy of sweeping sand on the playground. Of the five hours he spends at vuggestue, two of those are usually spent napping. The kids are stripped down into a onesie, then covered up under duvets and laid in these prams. There are two open-air rooms like this full of prams. They get to sleep in the fresh air everyday, no matter the temperature (well, as long as it's above -10 Celsius). Napping is not Felix's forte, so he generally wakes up after an hour. Why sleep when you can play?!?! Only one kid won't wear a hat. Every so often the pedagogues take the kids on a field trip. 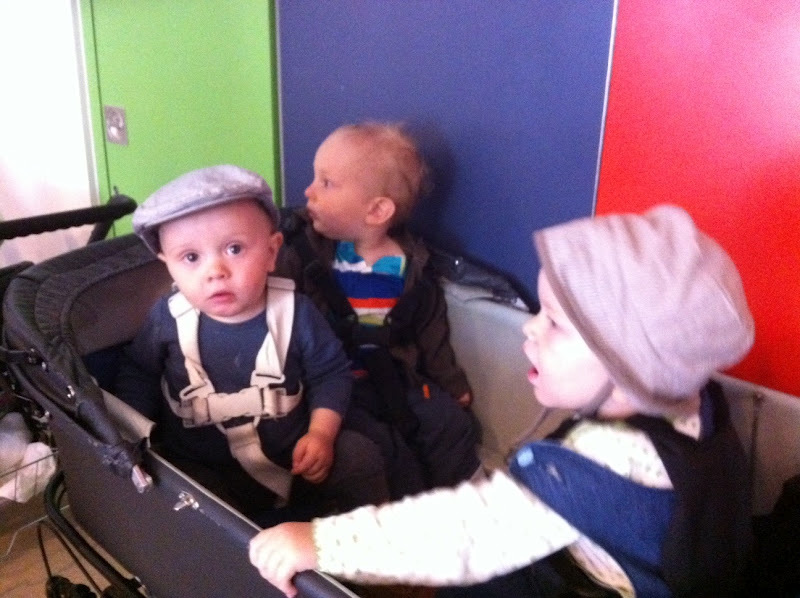 Four kids fit in these big prams. I imagine it's much nicer to sit in a stroller with your friends, than by yourself. Last week, they visited the fire department next door. This morning, they were headed out in the sunshine to a nearby woods. Leaving Felix in the care of someone else was the hardest thing I've had to do so far as a mama. There are still some days when I wonder if it's right, but when I am reminded of the great experiences he is gaining, I calm down. I also know it has helped me be a more balanced mother. Without close friends and family around to help out on occasion, and with babysitters costing $20 per hour, there was really no other option for me to have a break. And with a little brother or sister for Felix arriving this fall, I know I'll be grateful for a comfortable place where his needs are met and I can focus on the new baby while also having time together each morning and afternoon. What's the matter with Denmark? Oldies, but goodies, from the Daily Show.